August 8th, 2007, I had returned home from a vacation with my family. As part of the typicalritual after time away from home, I began the challenge of viewing the abundance of e-mails received through that duration. I found my attention captivated by desperate pleas for prayers regarding a baby boy in Los Angeles. My heart ached for this precious child and his dear family as I read the words of the plight. This family had anticipated the birth of a healthy baby boy. They had sought superior medical care and tests during the pregnancy to conclude that the unborn child was developing well, and all indications stated the baby was indeed healthy. Shock and despair consumed these parents moments after the birth of their son, Andrew. He was not the epitome of good health; to the contrary, he was in a battle for life. Andrew was born with thirteen birth defects of which several required immediate surgical intervention. This child was destined to die but to the amazement of medical professionals, Andrew continued to fight against all human adds and survived day after day. It soon became apparent that Andrew would require 24-hour care, seven days a week and that was not within the birth families capabilities for numerous rationalities. It was at that juncture they began the quest to find a family for their son. I soon found myself consumed with thoughts of baby Andrew and his family, and prayed for them continuously. Emails continued to arrive from CHASK with intensified pleas for prayer to locate a family for Andrew. I simply could not deny my emotional attachment to this family so I sought permission from my husband to contact CHASK to discuss further details of more specific details pertaining to the infant. I knew we were not considering the adoption of another child; yet, my heart insisted that I make that telephone call. After I hung up the phone with the CHASK representative I felt an even stronger urge to continue a quest to learn more intimate details. My husband and I agreed that I should talk with the birth mother, and so I did. To our surprise, she actually contacted me. It was at that moment, God revealed His plan for Andrew and our family. This was not just a matter of prayer for us. This was our baby! Perhaps another adoption was not our plan but God was clear that it was His agenda. The birth mother and I spent hours talking on the telephone about each peril that impacted Andrew’s body. I knew with each report she provided she anticipated that update as the one that would cause us to say that we were no longer interested in adoption. I assured this loving mother that I loved this child just as he was. After all, Andrew was created in the image of God for His purpose and His glory. This was not about failures on behalf of the parents or faults of the physicians. This child was about God and His perfect plans. As I mentioned, we had not planned to adopt more children so our foster care license had lapsed. That meant that we no longer had a current home study. We did not know of any attorneys to assist us in this situation. Surly, I did not understand the legal aspects of taking an infant from the hospital. I thought I would have days to seek answers to all of the questions but that was certainly not the fact. Aug. 9 I was requested by the hospital to pick- up the child as we were going to be discharged. I explained my concerns and the reality that I lived many hours from the hospital. There was no compassion from the hospital administration for the situation but that was an incorrect assumption. I was informed that I would be charged an hourly rate for the hospital to care for the infant. Again, I stopped and I prayed. I poured our my heart and tears to the Lord that if it were His will for our family to embrace this baby that He would intervene. I simply asked that He would open all of the closed doors so I may pass through if it were His will for this adoption. Within moments of my prayer, I learned that there was an attorney willing to ensure that the proper paperwork was in place for me to take Andrew home and he contacted the hospital in regards to holding Andrew until I could arrive. It was also no coincidence that a family friend persuaded me to go buy a car seat and other necessary baby items, “just in case” we were to pursue the adoption of Andrew. Within a few hours, another dear family friend and I were on our way to Southern California, and my husband was home to care for our other six children. Upon our arrival at the hospital, I was warmly greeted by Andrew’s birth parents. Although I was pleased to meet them, I was intensely excited to hold my new son. As I entered his room, I saw that beautiful baby boy lying amid the endless tubes, lines and machines. I could not weave my way through the medical equipment fast enough to finally hold this precious child. The birth parents stood nearby, amazed and overwhelmed, that I was not dismayed or frightened by the intense medical scene. I had knowledge of each piece of equipment and the ability to understand the alarms and readings. This brought both of us great comfort. They found peace in realizing that I was competent to care for this infant and I was relived to learn that I was familiar with the machinery. God continued to confirm that this was His plan and His hand was on each of us. As we waited for our portable machines and equipment to arrive, my friend and I had the opportunity to talk. It was at that moment in time I felt an urging to ask the parents to hold their baby for the first time. God knew that these parents needed to cradle this infant, even if only for a moment. I placed Andrew in his mother’s arms and we all cried together. It was one of those occasions where no words were necessary to share what the actions spoke. I am so blessed to have been given that fraction in time that will last a lifetime. The adoption process was a joy. The birth parents, the attorney, our social worker and our family were a united team for Andrew and as a result of our efforts (and God’s amazing mercy and grace) the adoption was final on Valentine’s Day 2008! Andrew ‘is a gift to this family’. The following year, on Easter, Andrew’s parents were baptized. Andrew entered the UCSF Medical Center shortly after our joyful welcome home celebration. There were more medical issues than was originally diagnosed. It was imminent per medical textbooks that our baby was soon destined to pass away. Fear and anguish was quickly replaced with faith and prayer. We called upon our dedicated family and devoted friends to join us in profound prayer for God’s will to be done. Beyond all medical rationality, Andrew survived another day. Ten days later we were back home. The medical care regiment for this child truly was a 24-hour-a-day task. Despite that we have multiple medically fragile children; our family came together as a unit to provide Andrew with every medical necessity and an abundance of love. His first year of life was truly a battle to survive. He endured multiple surgeries, numerous hospitalizations and countless medical appointments. During moments of dark despair, when all hope for him seemed to be lost this little miracle of ours would look into our eyes and share a bright smile. We now know that in that cheerful expression was God’s gentle assurance that all was well. In addition to the medical perils Andrew endured were the extraordinary expenses that accompany medical care. We have tremendous medical benefits but there were many “durable medical” items that were not included in our plan. Family, church family and close friends united to begin a quest to raise funds for these necessities. Our community joined our team and the fundraisers were and remain an amazing part of our journey. Each of these endeavors has permitted our family the opportunity to share Andrew’s story, which truly is a testimony of God’s amazing blessings. 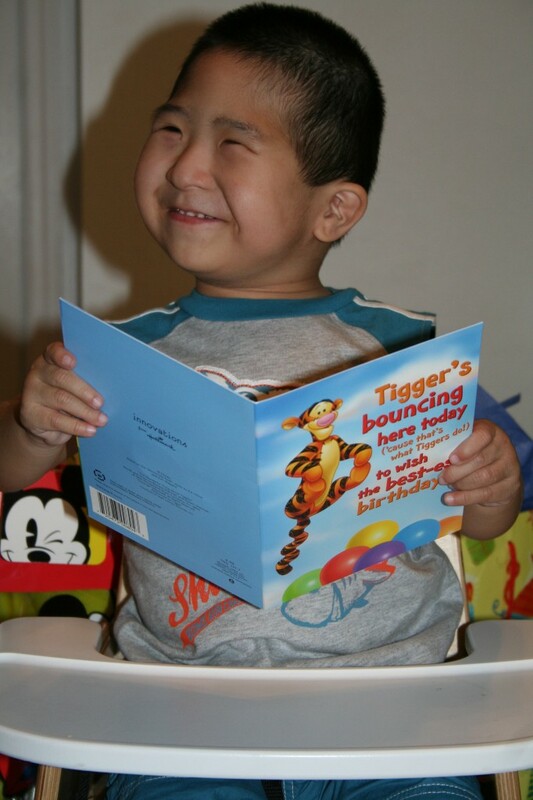 Today, Andrew captures the hearts of many people with his beautiful smile and delightful disposition and because of that gift we are continuously given the opportunity to share God’s gifts of faith, hope and love. Andrew is not only a blessing to those whom his story has entranced; he is a gift to this family. Although we learned so much from our other six children, especially those who have also battled against the perils of devastating medical conditions, but Andrew has taught us so much more such as true perseverance, steadfast faith and intimate hope. Though Andrew does not speak words, his message is profound. His legs cannot carry him but he travels through life with the endurance of a marathon runner. It is true that his eyes do not see but he has a vision beyond the restrictions of sight. Andrew does not fit into a “syndrome” but is constituted as sustaining “mid- line” damage. In short, that anatomy that is within the center of the body (brain, eyes-blind, hearing-profoundly impaired, trachea, heart, kidneys, liver, spine, testicles and genitalia) sustained damage of defect. Due to the severity of Andrew’s low tone muscular structure, neurological condition and other medical matters he will require the lifelong use of a wheelchair and twenty-four hour a day care. Traditional physical therapy did not prove helpful so those services were ceased and I sought other means to strengthen his muscles. I currently have him enrolled in swim therapy twice a week and equine therapy once a week. His instructors are amazing and their devotion to his sessions is heartwarming. We have also opted to homeschool Andrew opposed to seeking the public school programs and he is thriving! We are thankful that the Blind Babies therapist has been so instrumental in assisting us with designing the perfect pre-school plan for our special boy. He remains g-tube dependent and due to the abnormal airway that is not expected to change. So each week, I opt to make Andrew’s formula from fresh foods via a carefully designed menu by a dietician. To me, opting to take the roads less traveled to care for Andrew has been a wonderful tour. Andrew is such a joy. I thank God daily for the treasure of raising His precious child. Listening to Christian music, he loudly protests the tunes of nursery rhymes and secular selections despite he cannot talk, is Andrew’s favorite past time. From those first days at our home, we discovered that music was more than words set to a melody; it was a means for peace in Andrew’s soul. In the moments of his heart wrenching tears, the cries of his grave pain and the agony of his intense treatments, we would turn on his iPod and visibly watch his entire disposition change to a sight of serenity. In particular, the music by Tenth Avenue North touched the core of his delicate spirit and stilled the overwhelming turmoil. The treasure of music allowed Jesus the means to communicate His presence to our child in his darkest hours. Most recently, on the morning of December 5th, Andrew endured five surgical procedures. We waited hours to be called into the recovery room in anticipation of good news. Although four of the procedures went well, we learned that Andrew lost all hearing in his right ear and sustained a perforation in the left ear. He would still have hearing in the left ear, it would remain unclear to what extent. We tried to focus on the blessing that all hearing was not lost opposed to knowing that the right ear was rendered profoundly impaired. We also learned that further surgical follow-up procedures would be necessary for the left ear and one other procedure from that day. Again, we praised God for the good and tried to push aside the unfavorable updates. After the last surgeon had met with us we were invited to the recovery room. Soon after we arrived, Andrew began to softly sob. We gently placed his iPod at his left ear, with “This is Where the Healing Begins” playing and immediately a bright smile filled his face! Andrew does not have the ability to speak words but he does clearly communicate. In that moment, Andrew captured the attention of every staff member within the vicinity. Every individual stood amazed at what they had witnessed. As a result of that moment, we were again given the opportunity to share the good news about Jesus. Andrew is evidence that miracles of mercy and grace happen every day. Surly that does not mean there is no pain or suffering as those are tools that allow God to strengthen our faith and focus our attention on His will. We have endured trial and tribulations and celebrated triumphs through our journey with Andrew. I am thankful for each of those elements for the simple reason that God has permitted me to be a part of this precious story regarding His extraordinary child!